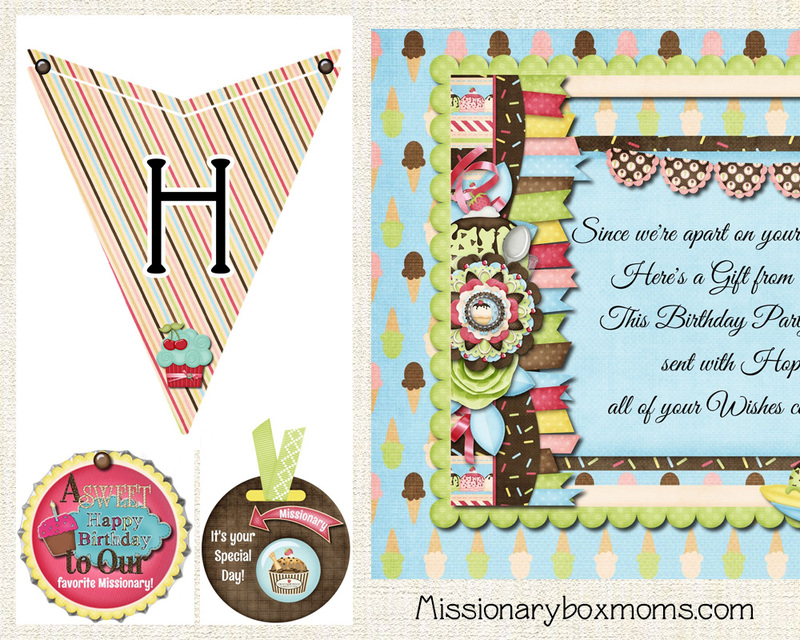 This ‘Birthday Party in a Box’ kit was designed to help you put together a Spiritual & Fun Care Package to help celebrate your Missionary’s Birthday with them from afar. The Box Flap Designs & Printables have over 63 beautifully-coordinated pieces – all for only $21.95. We can also customize your kit with the name of your Missionary and their Mission Name for an additional $5. ✔ 1-Page Custom Birthday Poem that could be included in with your Missionary Letter or could also be placed in the box right before you tape it up. ✔ 3-Pages of Miscellaneous Birthday Tags to use throughout your box as desired that will continue on with your theme. ✔ 3-Pages to use to put together your Week of Birthday Fun Countdown. ✔ 13-Pages to use for your Birthday Banner.